We are glad to present to our readers this new session of the FORCES Round Table. Gian Turci's guest this time is Michael Siegel. As most of our readers know, Siegel is a tobacco control advocate who has become, shall we say, the Aleksandr Solzhenitsyn of the movement. We don’t believe that the parallel is an exaggeration. 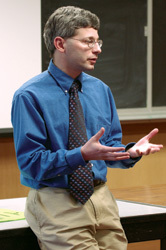 As he discusses with the host, the tobacco control movement has degenerated into an ideology aimed to control behaviour and culture through demonization, censorship, discrimination and promotion of hatred and intolerance, and for which any means – truthful or not, moral or not – is legitimate to get rid of the smoker. Such ideologies do not tolerate the slightest dissent, and promise harsh punishments for those who dare.